year we do supply books for library through donations and volunteers support. This year also we require your assistance and participation to make it success. We request you to support our organization through donations. We hope you will respond positively to our request. Your contributions will help students studying in Govt schools to improve their reading habits. Let us do together! India sudar has arranged training programs to our teachers. This is an important project. An effective training helps in improving the quality of teachers. This indirectly benefits the students at large in long run. Training program at Erode – 45 Hrs – 1 1/2 months . 3. Common Training program to all Indiasudar teachers. Considering the importance of English Language to Govt school students, India Sudar requests members to come forward and sponsor the training programs. Your great support is expected ! Your complete / Partial funding will be helpful. In villages girl children are neither habitual nor permitted to go to public libraries. So,school library is helpful for them. 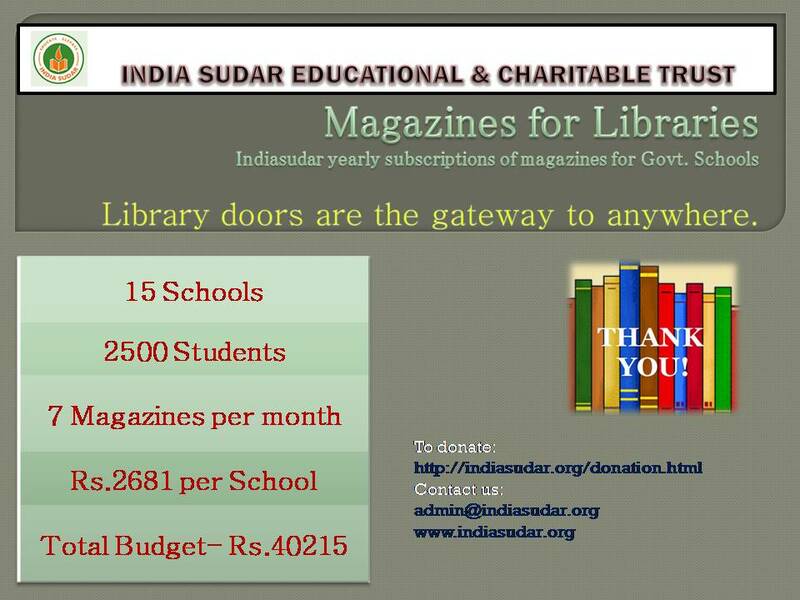 India sudar library is unique of its own kind in keeping specific collections catering to the needs of children and teachers.Students are getting current knowledge and visual taste by getting magazine’s in library they are exposed to various kinds of publications,issues, daily, news,letters etc. Creativity and exchange of knowledge is supported. students are identifying like- minded people among themselves.Makes them self motivated; keeps them in proper usage of time. Brings a dream that they should also build a library like this in future. Preparation of competitive exams,referring for projects participation in cross word puzzles ,sending artistic creations,preparing for quiz and other competitions etc. Getting advertisements about higher education courses career opportunities and call-for columns etc. Jai ho Indiasudar for the library. Printable version is available in the following link. Indiasudar requests you to see the possibility to print the same and display them in the noticeboards wherever possible. This will help like minded people to join India sudar and serve the needy. We thank our member Mr Sundara Kumar Padmanabhan who prepared the write up about India sudar in English. Our thanks to our member Mr Ramkumar in preparing the write up about India sudar in Tamil. Our special thanks to well wisher Mr Prem Ananth , Madurai who designed the colorful pamphlets. We have attached India Sudar Monthly Account Sheet for the month of February 2017.